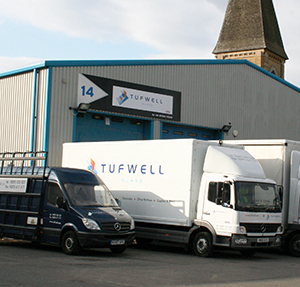 Tufwell Glass is a specialist glass supplier processing and the sale/installation of glazed partitioning. Many of our products and services are used to supply the architectural glazing and interiors markets. Based in West Sussex, Tufwell Glass offers a range of services including the supply and installation of frameless glazed partitioning. Toughening of glass and application of special glass finishes are all processed by our experienced staff to the highest standards. By using state of the art machinery coupled with a highly skilled workforce we are able to produce high quality glass products in a short period of time. Please download a copy of our company brochure here. If you would like to contact Tufwell Glass please call 01293 533 533 or visit the Contact Us section of this website. We like to provide our customers with as much help and information as possible so please see the links below associated with our business.